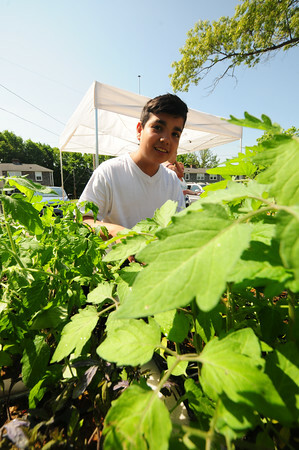 JIM VAIKNORAS/Staff photo Omar Mohmood, 12, helps sort plants at Kelleher Park in Newburyport Saturday, Nourishing the North Shore (NNS) helped iinstallKitchen Gardens there this weekend. This is a wonderful new pilot program funded by a grant from New England Grassroots Environmental Fund. There are 15 gardeners who signed up for this initiative and they will be tending to 11 gardens and a Kid's garden too. Everyone is very excited to start growing!